Understanding Duns Scotus's philosophy is notoriously challenging. 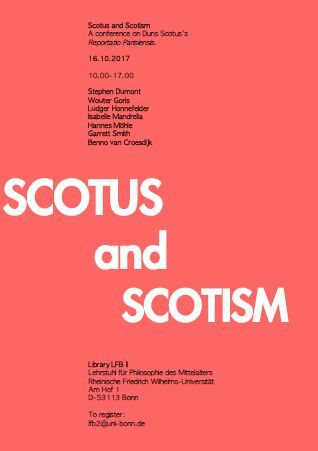 The goal of the Scotus and Scotism conference is to bring together researchers who work on the history and reception of Duns Scotus's Reportatio Parisiensis. New insights on the status of this text and its influence on later philosophical debates will be discussed. You can download a PDF copy of our poster here. Venue: Library LFBII, University of Bonn, D-53113 Bonn.